At 360 Forged, we base our entire business model on the craftsmanship of our products. We design and manufacture limited production, hand assembled wheels that consist of only the highest quality materials available. Our 3 piece and 1 piece sport inspired wheels are engineered and designed in the same fashion as our flagship CF Forged Series. All wheels are offered in exquisite finishes such as, hand brushed aluminum, color matched paint, chrome, polished aluminum and more. We precision machine the wheels to fit your vehicles specifications. Aspects such as bolt pattern, center bore, and back spacing are all machined individually per order. All machining is completed in our Miami Florida production facility using the most technologically advanced CNC machinery in the industry. We hand assemble each wheel to ensure proper torque settings and runout. Each wheel is also individually inspected for any visual or structural issues using a 20 point inspection process which ensures that no wheel leaves our facility with any problems whatsoever. 360 Forged extends a LIFETIME structural warranty and a 1 YEAR finish warranty on wheel purchases only. 360 Forged will only repair or replace wheel(s) if a valid warranty issue is confirmed. Warranty related issues included incompatibility of wheels to vehicle due to machining error, faulty finishes and structurally defective rim components. A warranty issue does not constitute cancelation, return of purchase, discounts or compensation of any sort. 360 Forged cannot be held liable for any additional expenses sustained by purchaser in compliance with a warranty claim or inability to use wheels while a warranty claim is processed. • Damages due to improper mounting and balancing. Contact free or rubber protective rim clamps are required for tire mounting. Tire balancing must be completed hub centrically. • Damages due to improper installation onto vehicle. Installation must be completed by use of a manual torque wrench in combination with Teflon coated thin wall socket. • Damages due to road hazards or debris such as potholes, rocks or any other object or condition not normally found on the roadway. • Damages due to careless driving such as curb scratching wheels or involvement in an accident. • Damages due to improper maintenance or cleaning of wheels. Wheels should only be washed with a mild soap and water. Acidic cleaners or degreasers will compromise the durability of the wheel's finish. Warranty is extended only to the original end-use purchaser and shall not be extended to any other person or transferee. Claims for warranty are subject to inspection and are required to be returned to 360 Forged at purchaser's expense. Warranty claims will be validated at 360 Forged's discretion following thorough inspection. Valid warranty claims will be repaired and / or replaced and returned to purchaser at no additional cost. If a warranty claim cannot be validated, 360 Forged will not cover return shipping expenses but will assist in making repairs to the wheel(s) as economically as possible if the purchaser wishes to do so. 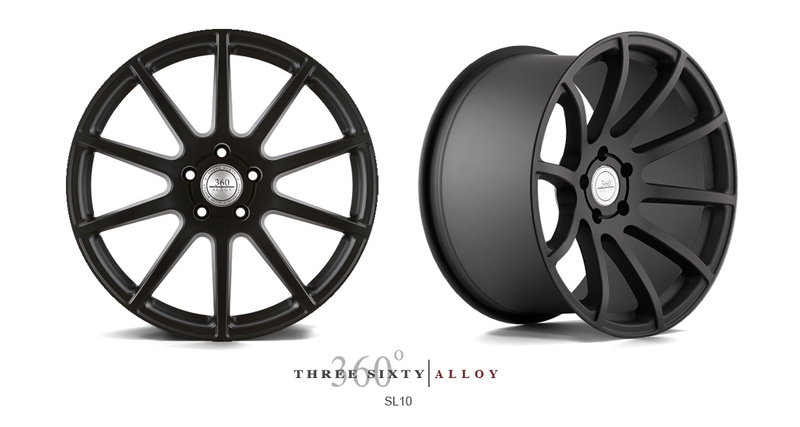 360 Forged | Alloy - Mesh 8 - 20"
360 Forged | Alloy - SL10 - 20"
360 Forged | Alloy - Spec 5 - 20"